Varying the types of posts you make to a social network is one way of getting more attention for them. Choosing the right type or format for a post makes it more likely that you’ll communicate in the most effective way and get the response you’re looking for. The classic status post is informational: Here’s what I’m doing now. (That’s the origin of all those jokes and complaints about people posting their breakfast cereal choices on Twitter.) In a business, a status post answers the question, What are you working on right now? One of the virtues of sharing this information on the social network is it can eliminate the need for the dreaded status report meeting, which consists of going around the table and having every member of the project team share a quick summary of their progress. When team members share their statuses regularly in a social workspace, they keep tabs on each other’s progress on an ongoing basis. However, a steady diet of status posts can get boring. Effective collaborators make use of other post types, including questions, polls, and thank you/recognition messages. One of the most useful things you can post to a social network is a question. Questions start discussions, and active discussions make a social feed more lively, interesting, and useful. Posting a question to a social network is particularly valuable when you don’t know who may have the answer. You can post your question to the company-wide feed or to one or more groups related to your topic, and often get back an answer much more quickly than would be possible through any other means. Posting a question is a sort of search, just one in which the intelligence for returning an answer comes from people, not software. Instead of putting your energy into composing the perfect search query, you must take care to properly tag your post and consider what community or social stream to publish it into. 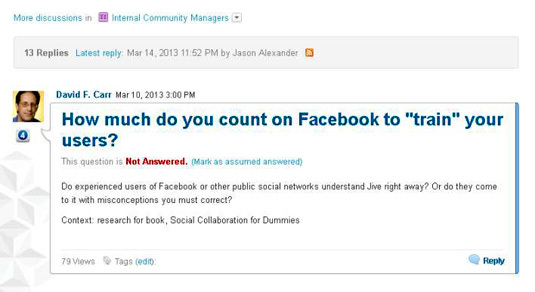 Some social platforms, such as Jive, treat questions as a separate content type from standard status posts, as shown in the following figure. This allows Jive to track whether your question has been answered. Employees seeking to show off their expertise can browse for unanswered questions and respond to them. For quick feedback on a question that has a limited number of answers, consider formulating your question as a poll. Yammer makes it easy for anyone to create a poll question followed by a series of possible answers. The poll answers are then displayed as a multiple-choice list, with a chart of user opinions created interactively as members of the social network vote on the question. 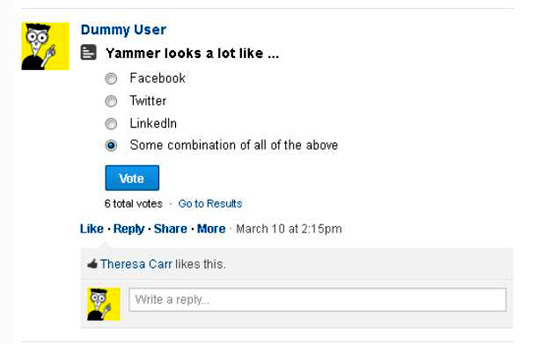 The following figure shows a Yammer poll. A social network is a great place to thank and recognize the people who help you get your work done. A social post is a way of publicly acknowledging their contribution in front of the whole company or a group of their peers. Social recognition is so powerful that some social-minded organizations (such as Facebook) have incorporated recognition given by co-workers as well as supervisors into their formal framework for employee performance evaluations. Work.com, from Salesforce.com, is based in part on Facebook’s relationship as a customer and design partner of Rypple, a startup that Salesforce.com acquired. 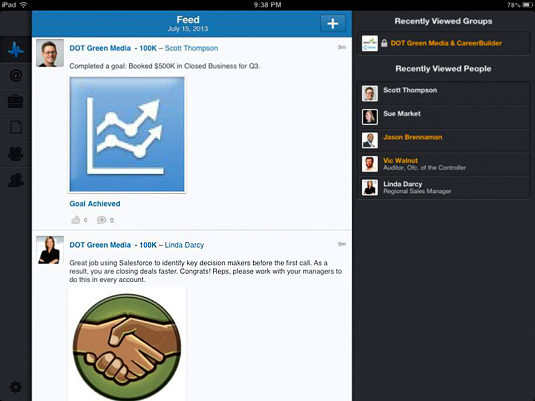 Used in combination with Chatter, Work.com is a social performance management application, meaning that it encourages employees to share their goals and achievements on the social network and allows for peer-to-peer recognition of good work. The next figure shows this activity displayed in the Chatter iPad client. Social recognition approaches often let users award “badges” to each other to signify the type of recognition granted and make recognitions stand out from other social posts. See an example in the last figure, from Yammer.